This white wine blend is very light in coloring. It smells like honeysuckle and citrus with afterthoughts of vanilla and cedar. The wine is thin to medium bodied. Plenty of butter coats the mouth. Other than that buttery quality, there is honeydew and perhaps honeysuckle—I’ve never eaten it, so I can’t pinpoint that flavor well. The wine tastes thinner the more I drink it. Green apple, cream, and lime try to break through near the end of the sip, but the butter overwhelms them. It smells more intriguing than it tastes. That strong butter element limits its depth of flavors, but it’s serviceable—you will have wine, and you will not be displeased about it. 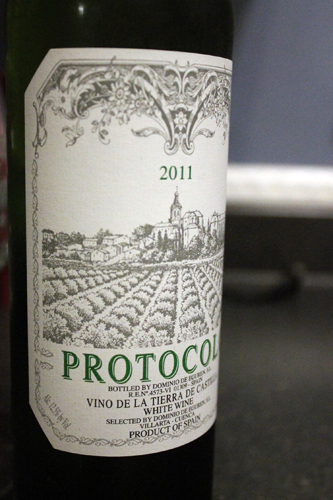 The color of this wine was very light. . . . Its nose was good and bright with hints of fruit. The wine had a good balance and was a little bitter. . . . I could taste the mint. . . . It was a little sweet as well. It was almost clear in color, and had a somewhat tropical aroma. That aroma was fulfilled by its pineapple flavor. It had a low viscosity, and was fermented in 100% stainless steel barrels. While it was refreshing, and had an interesting flavor component, it wasn’t my favorite of this session. The smell of this wine was crisp. It seems inviting, because the smell made it seem like it would roll across the palate and not be thick. When tasting this wine it was a bit dry and tart. There was a bit of crispness that I picked up on the smell.